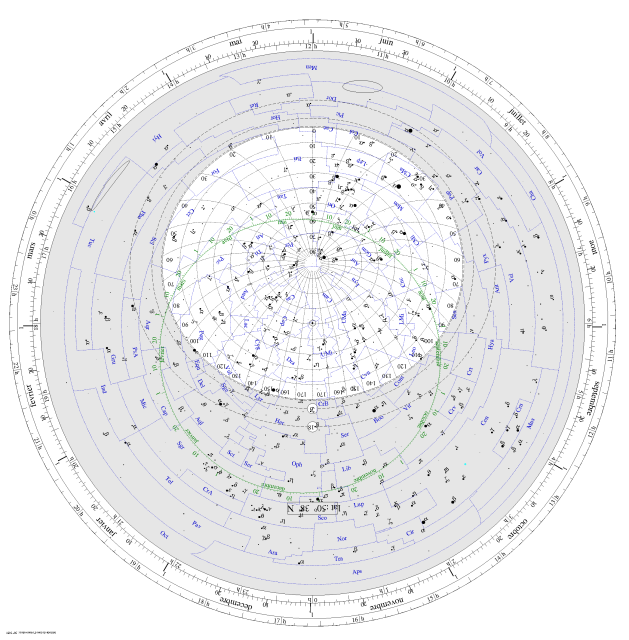 Constellation maps divide the celestial sphere into 88 parts, known as constellations, helping astronomers locate stars and deep sky objects. The constellations that can be seen in the sky at night depend on the observer’s location and season, and they change throughout the year. 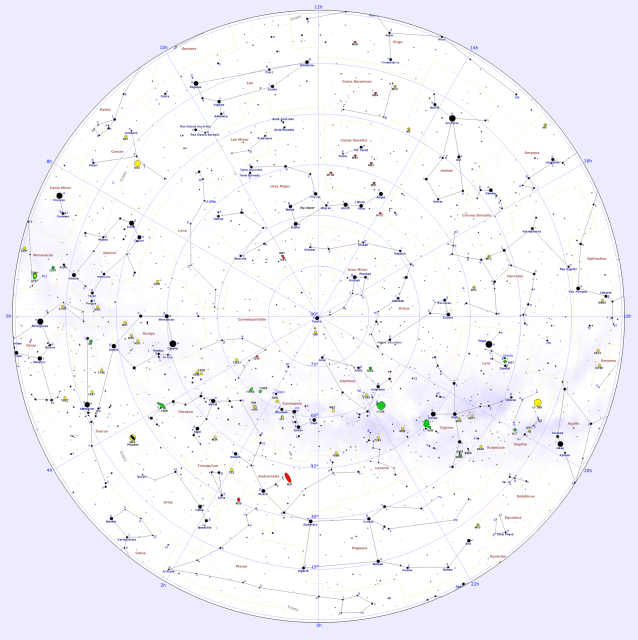 Out of the 88 constellations recognized by the International Astronomical Union (IAU), 36 are found predominantly in the northern sky, while the remaining 52 are located in the southern sky. As our planet spins on its axis, we see different constellations, with stars appearing to move across the sky from east to west, just as the Sun rises in the east and sets in the west from our point of view. As the Earth orbits around the Sun, constellations move slowly to the west over the course of a year and we see different parts of the sky at night because, as the seasons change, we are looking in a different direction in space. The celestial sphere, an imaginary sphere surrounding Earth, is divided into the northern and southern hemispheres by the line of the Earth’s equator, extended into space. Similarly, the Earth’s North and South Poles, extended into space, mark the north and south celestial poles. The north celestial pole can be easily located because it is marked by Polaris, a relatively bright star located in Ursa Minor constellation. 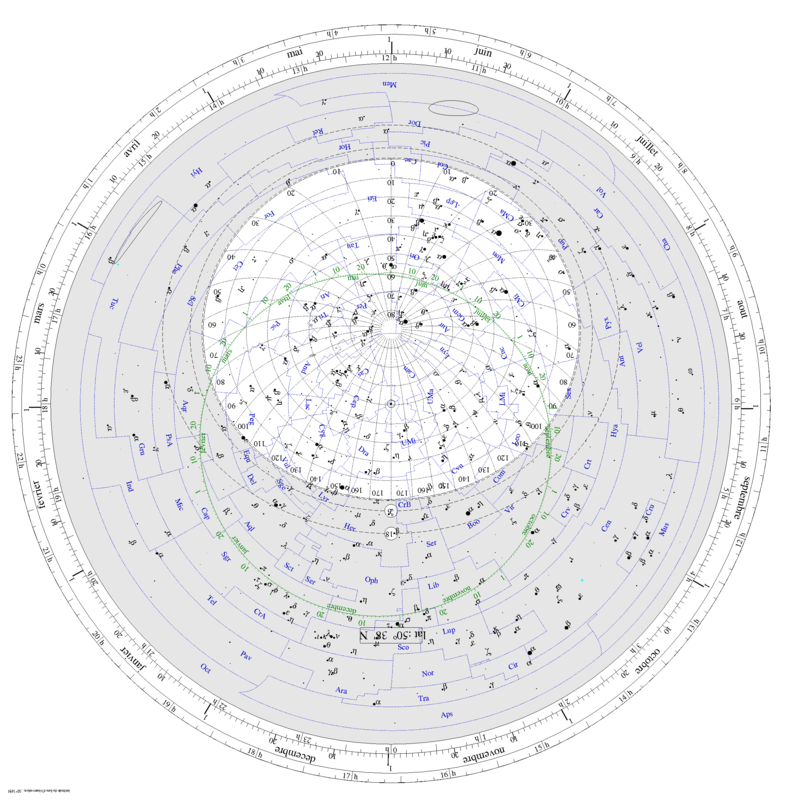 The south celestial pole is a bit trickier to pinpoint because there are no naked eye stars marking its location. Polaris and other stars lying near the celestial poles appear to move across a smaller area than stars lying closer to the equator. The farther they are from the poles, the wider the circle the stars make across the sky. The stars that are close to the poles never set below the horizon for observers in locations where the stars are visible: they are circumpolar. Near the equator, there are no circumpolar stars. With the celestial poles on the horizon, all stars appear to rise in the east and set in the west for observers at the equator. Observers can never see all 88 constellations from a single location on Earth. While some of the southern constellations can be seen from northern latitudes at certain times of year – Scorpius, for instance, is visible over the southern horizon in the summer – others never rise over the horizon. Crux, also known as the Southern Cross, which is prominent enough in the southern sky to be featured on several national flags in the southern hemisphere, can never be seen from most locations north of the equator. Similarly, the constellation Ursa Minor, which contains Polaris, the closest bright star to the north celestial pole, cannot be seen from most places south of the equator. 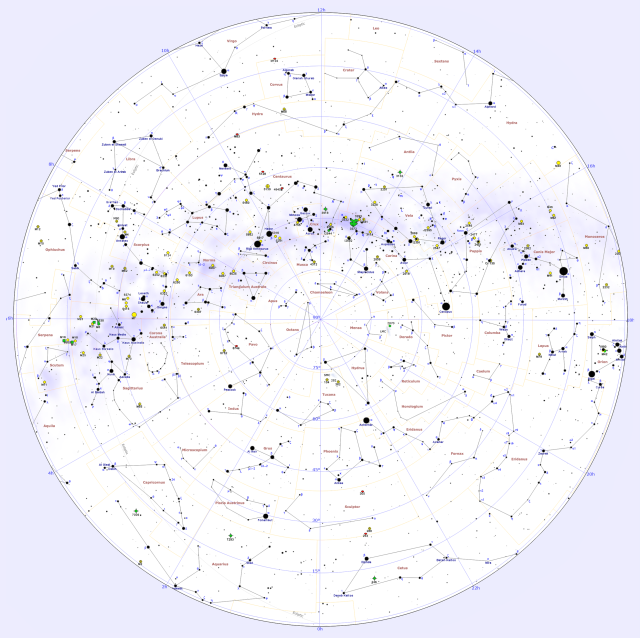 The position of all stars and deep sky objects on the celestial sphere is mapped relative to the celestial equator and poles, just as different locations on Earth are mapped using the equator and Greenwich, England. A star’s latitude or position north or south of the celestial equator is called declination, while its longitude or position east or west is called right ascension and measured in hours, minutes, and seconds.